His Holiness the Dalai Lama and Lama Zopa Rinpoche, Blue Mountains, Australia, June 2015. Photo by Ven. Thubten Kunsang. 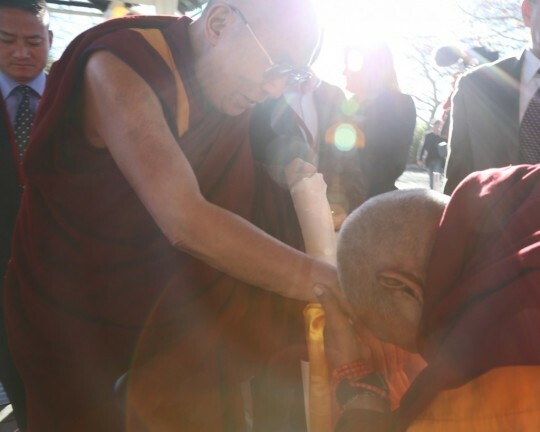 As many people have already been doing and continue to do the long Kshitigarbha mantra to pacify earthquakes, they can also dedicate this practice to His Holiness the Dalai Lama’s long life. His Holiness is currently resting after receiving treatment at the Mayo Clinic in the United States. He will resume his teaching schedule in March 2016. On February 4, His Holiness recorded a video message for Losar, Tibetan New Year. His Holiness speaks to Tibetans in Tibet and in exile as well as friends and supporters worldwide from Rochester, Minnesota, US. His Holiness speaks in Tibetan with English subtitles.